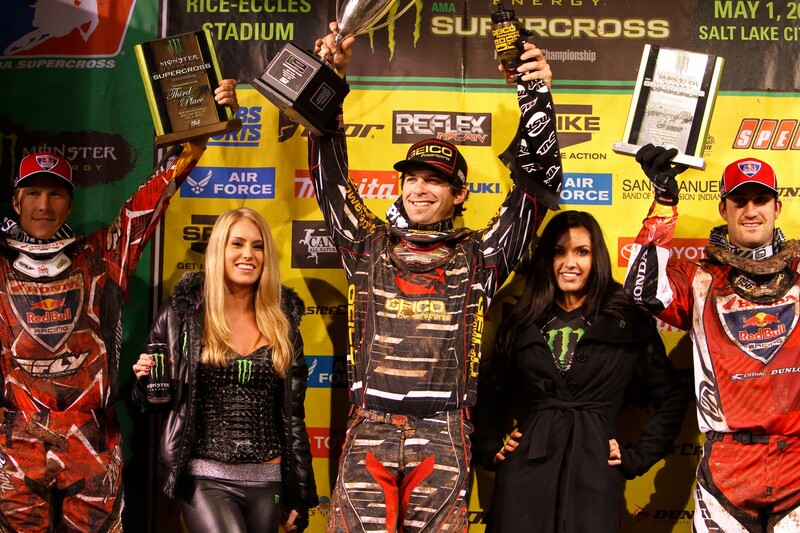 This isn’t Chad Reed’s best season, but it’s likely going to be one that helps him set a record. If Chad lines up in the main this weekend, he will tie Mike LaRocco atop the all-time AMA Supercross starts list with 227. If he makes it in at Tampa next weekend, he’ll break the record, which is amazing timing since Tampa is basically Reed’s adopted home in the U.S.
Makes grinding out some Last Chance Qualifiers and dealing with a bad ankle a little more worth it, right? Expect much hoopla as Reed ties and breaks this record. For now, let’s reintroduce the Oldest Supercross Winners stat sheet for this week’s The List. By the way, Reedy is now 35 (he’ll be 36 in March). A win at any point would smash LaRocco’s other record. LaRocco’s win was storybook: it took place at his home race in Indianapolis, a place where he had never won. He also got the holeshot, which, if you know LaRocco’s career, you know almost NEVER happened. The crowd went nuts from beginning to end in this one. Chad was in that Indy race that LaRocco won in 2004. He had just turned 22 years old and was heading to his first AMA Supercross Championship. That night, he crashed in the first turn and came all the way back for third. He was still mad that he didn’t win—and now, years later, it probably stings more because had Chad beaten Mike in 2004, his Atlanta 2015 win would make him the oldest SX winner ever. In that Atlanta race, Chad held off a Ryan Dungey charge to score a popular win. It still stands as his latest supercross win—we’re smart enough to not use the word “last” here. You never know with Reedy! If anyone did not seem destined to win a 250 supercross race, it was John Dowd. A workhorse who didn’t even start racing until age 21, he was so bad at timing supercross jumps in his early days that his Yamaha teammates started calling him “frame stretcher.” But Dowd kept working. And working. And working. He was good enough to win the 1998 125 SX West Region Championship. 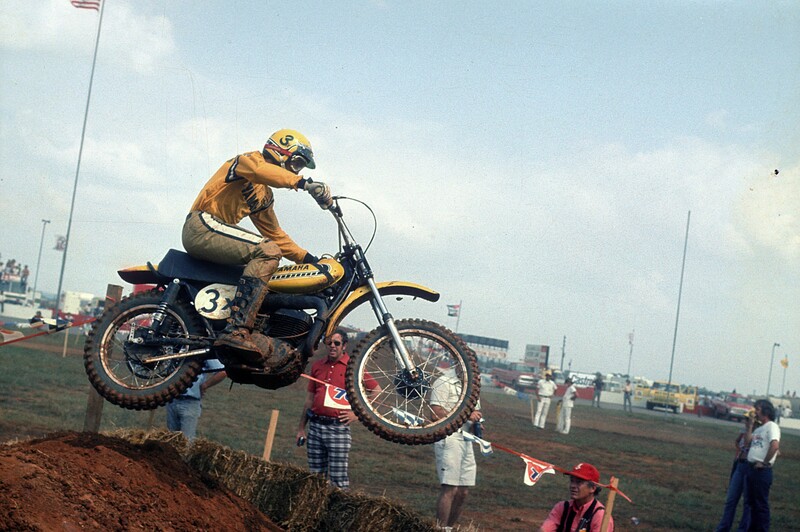 Along the way, when the series headed East, Dowd hopped on a YZ250 and won a mudder in Charlotte. At the time, this set the record for oldest winner. When K-Dub got hot, he could beat anyone, and late in 2010 he found his groove and reeled off the win in SLC. He also won the race the weekend before in Seattle, so this is certainly the oldest win streak in the sport. At both races, the fans were going crazy! Wardy set the old standard for longevity in the sport. Back in these days, 26 was considered old. With this win during the 1991 season, Ward recorded at least one supercross win in eight consecutive seasons, a record at the time. That McGrath guy went on to get wins in nine consecutive seasons. The 2012 field was decimated by injuries, including home state boy and AMA Supercross Champion Ryan Villopoto, who crashed on the first lap of this race and tore his ACL. This left the win up for grabs, and Andrew Short, one of the oldest riders in the field, battled Ken Roczen, one of the youngest, for the victory. Shorty came out on top for his only career 450SX win. McGrath holds most supercross records, so of course he’s in the hunt in this category as well. We’ve said it before, we’ll say it again: no one had a career like Larry Ward. He won a race in Seattle, his home race, at age 19 in 1990. He didn’t win another until 1998! Then he won again in ’99, in the same building where he won that first race nine years earlier! Twenty-eight was considered ancient by the standards of the day, but on rough tracks, Hannah could still fly. This one happened at Daytona, where Bob was a beast. A rare walk-off—this was the last AMA Supercross race of Glover’s career, and also the last he would race on a Yamaha, which had been his lifelong backer. The following year, Glover headed to Europe to help KTM develop a new generation of bikes in the Grand Prix circuit. 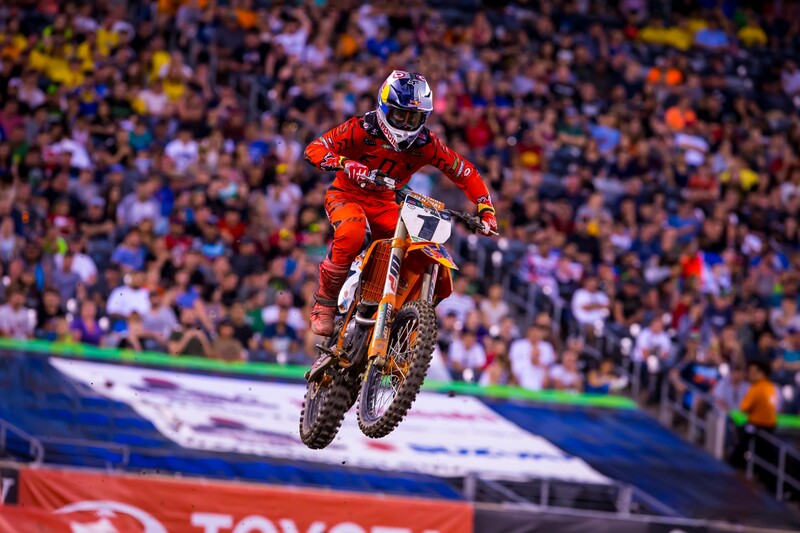 Musquin won the opening round of the 2018 Monster Energy AMA Supercross Championship. A feel-good win, because everyone loved Dr. D. This was not only his last win, but also his first. His Yamaha teammate Damon Bradshaw almost caught Doug at the finish, but Bradshaw, who famously hated second, seemed as pumped as Doug! Karsmakers was something of a mercenary, hired by Yamaha to move away from the Grand Prix circuit and bring his competitiveness and his knowledge to their new YZ weapon. Being from Holland, he was a superb sand rider, and Daytona was right up his alley. Interestingly, he won this race twice—he also won the 1973 version in the 500 Class, but that race predated "AMA Supercross" as a series and instead counted as the opening round of the AMA National Motocross Championship. Again, ancient by the standards of the day. The Jammer’s 1979 season also included the famous “paddle tire race” on a sandy track in Oakland. This Daytona win, two months later, came on actual knobbies. Weinert finished the year a solid second in points to Bob Hannah. No one really thought of Dungey as old last year, but it turns out he was on his way toward retirement. His teammate Marvin Musquin was riding really well on this night, but, ahem, the record book has this one down as a win for Dungey.